Horizon 2020 (H2020) is the largest source of public funding for research and innovation from the European Commission. It has a budget of around €3.7 billion for the Societal Challenge 2 (SC2) on ‘Food security, sustainable agriculture and forestry, marine, maritime and inland water research and the bioeconomy’ for 2014-2020. 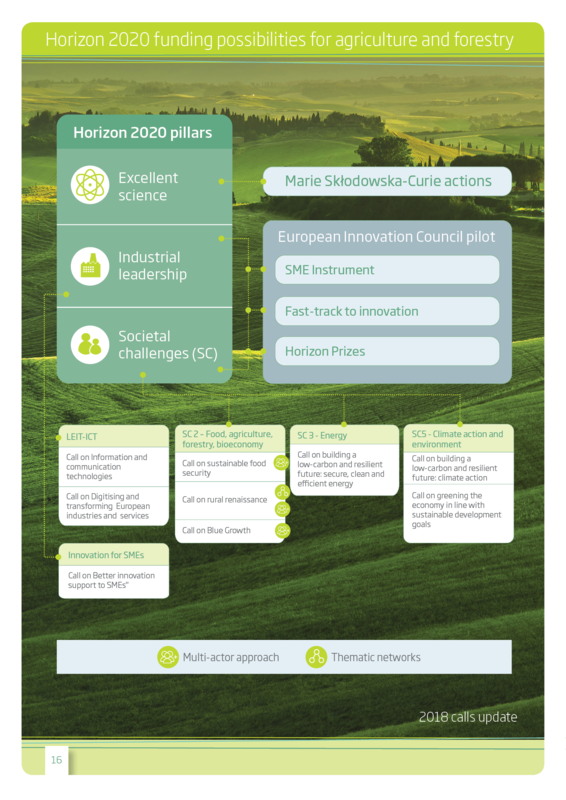 Through the SC2, H2020 aims to create solutions for problems which farmers and foresters currently face. It funds projects in which researchers and stakeholders build solutions together, sharing knowledge and producing results that are ready to be put into practice. The projects are actively supported by the European Innovation Partnership ‘Agricultural Productivity and Sustainability’ (EIP-AGRI) network. The H2020 calls are open to all organisations and individuals, including applicants from outside the EU. Horizon 2020 also works across different areas and themes to boost innovation. This is why relevant opportunities for agriculture also appear in other parts of H2020 work programme as well as SC2. This brochure should help you find your way through the different calls for 2018.